To celebrate Mother’s Day, our Women’s Craft Cooperative has designed a brand new limited-edition necklace. Fo r a donation of $65 or more, this one-of-a-kind statement necklace is the perfect gift for a mother, wife, daughter or special someone. This purchase will help make life a little better for the 12,000 women Rosie’s Place serves each year. This stunning two-tier necklace is 18” in length with a 3” extension chain. 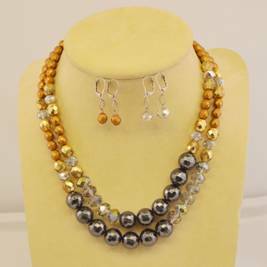 Czech matte gold, faceted hematite and fire-polished crystal beads combine to create an elegant piece that is perfect for spring. Matching earrings feature a choice of dangling gold or crystal beads and pair beautifully with the necklace. The earrings are $15 alone or as a set with the necklace for a special price of $75. A card informing the honoree of the donation in her honor will accompany the set, which will be beautifully packaged in a box and tied with a bow.